Alexander Calder's monumental mobile moves solely on the air currents in the East Building's Central Court. The sculptor originally intended the work to have a motor, but the use of advanced, lightweight materials made this unnecessary. Paul Matisse, grandson of the French artist Henri Matisse, enlarged Calder's original concept thirty-two times to its present dimensions. Rather than use welded steel—Calder's customary choice of material—Matisse employed aluminum for this mobile, strengthening its stress points with molybdenum. The buoyant panels appear solid built are actually hollow honeycomb-type structures covered with paper-thin aluminum skins. Although the sculpture's wingspan is just over eighty-five feet across, it weighs only 920 pounds—two tons less than if it were made of ponderous steel. After studying scale models of the East Building, on April 28, 1972, Calder composed the original maquette, or small three-dimensional model, which is also in the Gallery's collection. Starting at the bottom arm and working progressively upward, he established the centering for each part before attaching it to the next higher, unfinished section. By maintaining equilibrium in this way, Calder could concentrate on cutting the shapes and bending the rods. As with most of Calder's work, this mobile draws inspiration from organic forms—flower petals, fish fins, bird wings—which enlivens its geometry. The mobile is simpler than many of Calder's earlier, more intricate pieces. The composition opposes two orientations, two silhouettes, and two tones: the triangular, painted red; the upper assembly, by contrast, is all horizontal, roughly wedgelike, and rendered in black except for the largest plane, which is deep ultramarine blue. Calder selected a position for the mobile that brings its lowest plate into tantalizing proximity with the structure of the East Building: at times, the red tail seems as if it might collide with the building's interior architecture, but the mobile playfully escapes contact (by mere inches) and continues in slow revolution. When informed during the mobile's construction that size adjustments would be necessary to avoid actual contact, Calder joked, "Personally, I might be in favor of a little rubbing or bumping." When asked to title the National Gallery's object, Calder replied, "You don't name a baby until it is born." Unfortunately, he died one year before the finished mobile was hoisted up to the space-frame roof on Friday, November 18, 1977. Thus he never witnessed the "birth" of his last major commission. Commissioned 3 May 1973 by NGA; installed 18 November 1977 in the NGA East Building. 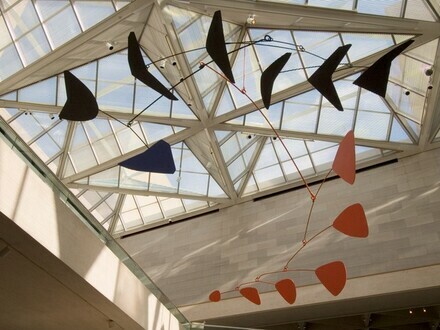 Alexander Calder: 1898-1976, National Gallery of Art, Washington, D.C.; San Francisco Museum of Modern Art, 1998, no. 267, color repro. (shown only in Washington). King, Marian. Adventures in Art: National Gallery of Art, Washington, D.C. New York, 1978: 121 [illustrated by 1975.114.1, pl. 77]. Wilmerding, John. American Masterpieces from the National Gallery of Art. Rev. ed. National Gallery of Art, Washington, D.C., 1988: 46, repro. Kopper, Philip. America's National Gallery of Art: A Gift to the Nation. New York, 1991: 9, 304, 312-313 repros. National Gallery of Art, Washington. National Gallery of Art, Washington, 1992: 274, repro. Sculpture: An Illustrated Catalogue. National Gallery of Art, Washington, 1994: 40, repro. Hughes, Robert. American Visions: The Epic History of Art in America. New York, 1997: 420, color fig. 251. Alexander Calder: 1898-1976. Exh. cat. National Gallery of Art, Washington; San Francisco Museum of Modern Art, 1998: no. 267. Gilbert, Rita. Living with Art. 5th ed. New York, 1998: fig. 338. Warren, Lynne. Alexander Calder and Contemporary Art: Form, Balance, Joy. Exh. cat. Museum of Contemporary Art, Chicago; Nasher Sculpture Center, Dallas; Orange County Museum of Art, Newport Beach; Nasher Museum of Art at Duke University, 2010-2012, fig. 9. Harris, Neil. Capital Culture: J. Carter Brown, the National Gallery of Art, and the Reinvention of the Museum Experience. Chicago and London, 2013: 155, 259, 430.